As one of Bude’s most unique restaurants, The Barge offers a menu created with fresh local produce but with a twist, providing a relaxing and unique dining experience upon Bude’s historic canal. I thought this was a great opportunity to be creative with the website design – I wanted to produce something that was unique and innovative. It felt like a no – brainer to make use of the the boat’s characteristics by incorporating wooden textures with hanging ropes to allow a user to distinguish between the sections on the page. Furthermore, I decided to incorporate a steering wheel navigation bar. 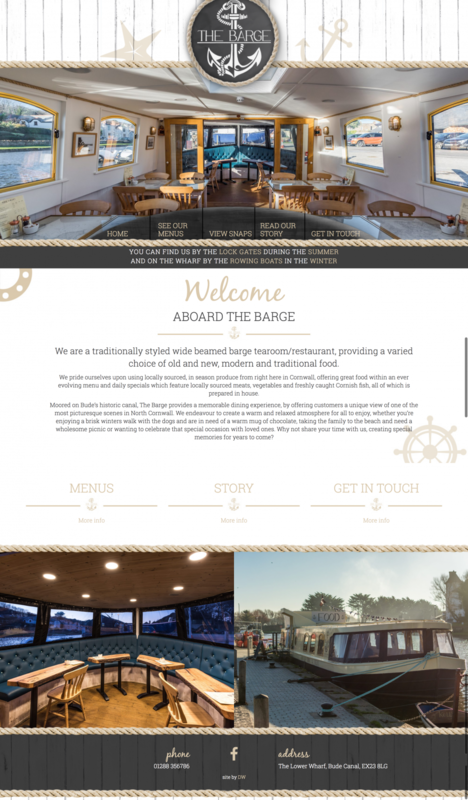 As well as the steering wheel driving The Barge, I wanted to give the perception of it steering your path through the website. If you haven’t already, take a look – especially on your phone! Click here to see the website. If you like what you see, click here to get in touch and discuss requirements for your site.